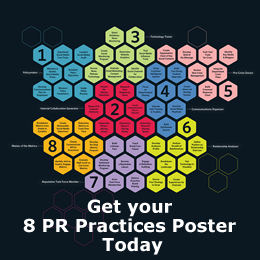 One of my favorite new practices, which is outlined in my book, Social Media and Public Relations: Eight New Practices for the PR Professional, is PR Practice #5: The Pre-Crisis Doctor. To continue with my edited or cut chart series, today’s post discusses the Pre-Crisis Doctor chart of responsibilities, and the many new roles PR professionals undertake, as they move from PR crisis managers to Pre-Crisis Doctors. As I stated in my book, Pre-Crisis Doctors are the PR professionals who, “… proactively monitor social media conversations and track the sentiment of customers and other stakeholders when conversations are under control.” Pre-Crisis Doctors do not wait until the crisis escalates to neutralize the situation, and they use technology wisely to stay abreast of any rising negative sentiment. You can see from the wheel visual below that there are several new roles and responsibilities for you to learn, as the Pre-Crisis Doctor, in your own company. The Pre-Crisis Doctor uses a different strategic process to prevent a negative situation from gaining momentum. Of course, the ideal scenario would be to stop the negative from ever starting, however, due to the nature of social media this is highly unlikely. Therefore, as a Pre-Crisis Doctor, it’s your responsibility to catch the negative sentiment, at a point when you’re able to react swiftly. You should have several resources in place, which includes everything from your company’s social media crisis organizational chart and the shell of the message to your measurement tools and key influencers to help keep the public updated with the most recent information. 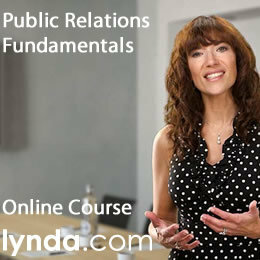 PR professionals are very familiar with the org chart, which provides the communications and reporting structure in a company. 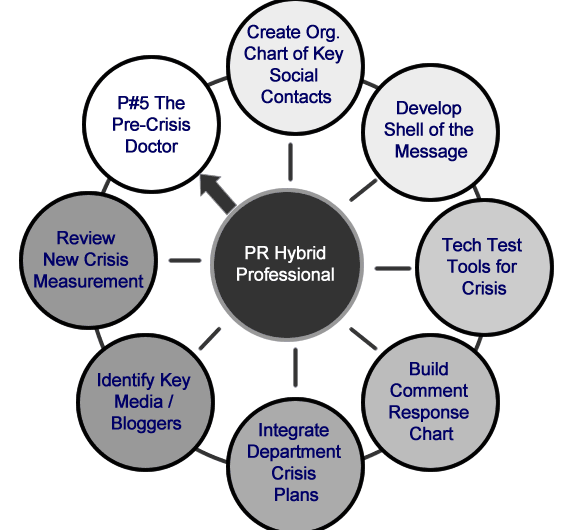 However, building a social media crisis organizational (org) chart gives the framework for who is involved at every different level of crisis escalation. The most common social media crisis org charts start with a bottom layer of social media activity and who is involved (no pending crisis) and works all the way to the highest level of crisis (full blown crisis) at which point your CEO, Chief Reputation Officer, Board of Directors or Cabinet may be directly involved in the situation at hand. When it comes to social media communications, it’s difficult to have every type of message planned because each crisis situation varies and will warrant a different approach, depending on the issue and the social media channel. 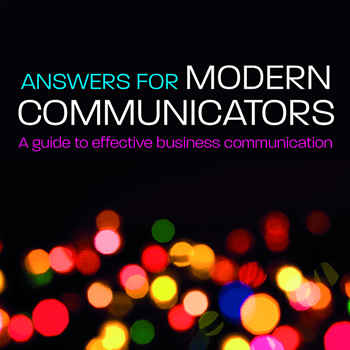 However, your company should know the shell of the message based on company policies, positions and ethics, which can be crafted to meet the requirements and culture of the communications channel. It’s always best to anticipate what could happen through each channel, and then go on the offense with your proactive messages. You will need to identify the best tools, resources and platforms to help you track rapid communication during a crisis. Your tools will also allow you to determine whether or not the crisis communications strategy is working to move the negative sentiment to neutral or positive. It’s imperative to research, demo, trial and test your technology long before a crisis begins. When you’re in the height of crisis, that’s not the time to be deciding the best resources to put in place. In addition, the tools you select should be easy for your team to use (tested beforehand), and also allow them to create the charts and reports appropriate for executives who are watching the situation closely. PR professionals are learning to listen closely to the dialogue of customers, media, bloggers, etc., whether it’s positive praise, product questions, service issues, organizational concerns or outright anger. As Pre-Crisis Doctors, they analyze how to move through different scenarios, as these conversations are documented and placed into “conversations buckets.” Building these conversation buckets becomes the infrastructure of your Comment Response Chart, or a decision tree. The Comment Response Chart helps professionals to determine how to handle various situations through a series of yes/no questions, which is a monitor/evaluate/respond strategy. 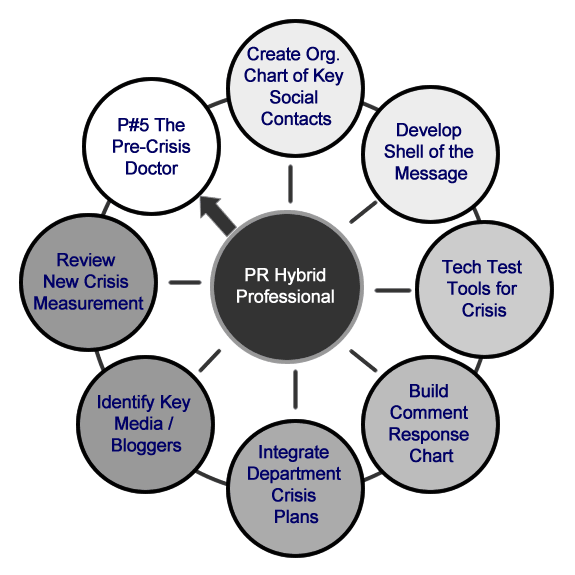 Because social media moves across the company, PR pros have to integrate the social media crisis plan to work in harmony with other departments, during a crisis situation. For example, customer service is an area that’s speaking directly to the customer, and there is a hierarchy of who in customer service will speak with a stakeholder, depending on the level of crisis escalation. Today’s social media crisis plans must take into consideration how different departments in the company, and employees in all positions, must be aware of crisis measures and directing communication to the appropriate contacts. 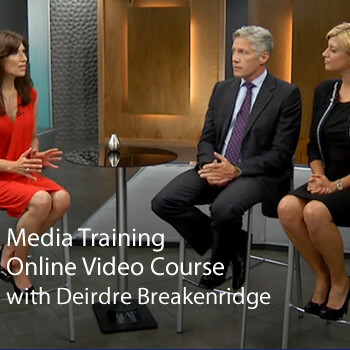 In the past, crisis managers built their plans realizing the importance of identifying and prioritizing media contacts that they would alert at the onset of a crisis. These journalists would also help to keep the public informed with updated information. The focus used to be solely on the media. However, today we include bloggers as powerful influencers during a crisis situation. One key reason to build strong relationships is when crisis strikes and negative sentiment runs rampant, you have an outlet to tell your company’s side of the story. One of your crisis strategies will be to properly identify your approach to measurement and what benchmarks will be used to determine if your evaluation and response system is working. Measuring aggregated conversations focusing on negative sentiment before, during and after the crisis helps to determine the crisis plan effectiveness. We have the ability to find the negative sentiment, and understand who and what’s being said in the context of a discussion. There is no more 24-hour news cycle, but rather a minute-to-minute news cycle through social media and your citizen journalists. Being a Pre-Crisis Doctor is a proactive approach to social media crisis, one that prepares the company for various types of negative conversations. The Pre-Crisis Doctor pinpoints the people, channels, messages and appropriate technology to use before the crisis occurs. 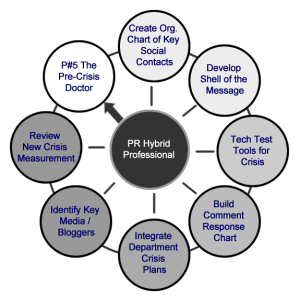 3 Responses to " PR Practice #5: Pre-Crisis Doctor Chart of Responsibilities "